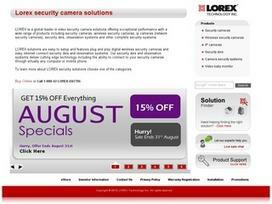 LOREX is a global leader in home and business security systems. Its systems feature video security cameras and personal monitoring equipment. LOREX systems are well-known for providing safety with exceptional performance. Consumers can buy a system that has been designed by LOREX, or they can opt to combine various LOREX products to make a system that is just right for their security needs. Shoppers may choose among products such as a security camera, a wireless security camera, an IP camera (a network-based security camera), a security DVR and an observation system. Or they can opt to buy a complete security system that combines multiple elements of many of these types of equipment. LOREX's equipment is made to ensure both the indoor and outdoor security of homes and offices. Shoppers who are interested in checking on the safety of their homes can select products such as video baby monitoring cameras. These cameras can be used to provide peace of mind that a baby is sleeping soundly and safely. Similar systems can be used to monitor the behavior of babysitters or other professionals in the home. The inventory at LOREX varies. However, most consumers will be able to find the products that they want for their security needs. For instance, shoppers can select a system with virtually any number of outdoor cameras and a professional security DVR. Consumers who need to monitor large areas can choose systems that include up to 16 cameras, and they can purchase these with DVR systems that are able to support up to 16 channels. Consumers who are worried about anything happening to their cameras can select cameras that have been created to be vandal-proof or ones that are even bulletproof. Consumers who do not want constant monitoring can choose systems with motion detector cameras. Systems like these can be monitored from the included DVR, and LOREX even sells monitoring screens so that home or business owners can monitor their DVR activity on their own dedicated screen. When they are not home, consumers can easily monitor their security cameras remotely form their iPhones, iPads, androids, Macs or PCs. Regardless of the specific system that a consumer chooses, he or she will find that the LOREX solutions systems are simple to set up. Some of the systems feature wireless security cameras that can be plugged into a variety of playback devices, and others feature the ability to be easily connected to the Internet. When shoppers decide to fill security needs on the LOREX website, they can look forward to several advantages. While shopping, consumers can easily compare different products, and they can spend time reading consumers' reviews. This information will help them to discover the system that is best for them. Once they have ordered a product, they can look forward to fast shipping, as LOREX sends items quickly. Share what you think about LOREX, and your favorite ways to save there! We bought a home security system from Lorex not long ago. Very pleased with the results.